The sarishop is stocked with the internet's largest variety of sarees - Many of them you won't get anywhere else but Sarisafari! Each sari you see in the sari shop has been handpicked on our yearly Sarisafari Textile Tour of India. Below is a quick overview of the kinds of sari styles featured in the sarishop. We specialize in indigenous handloom sarees in pure cotton and pure silk only. There are sarees from all over India - take time to browse through the collection, you'll be amazed at the variety! Just click on an image to take you to that section of the sarishop! For your reference check the glossary of sari terminology. Benares Brocades or Varanasi Silks are some of the richest sarees produced in India and is the most in demand sari for weddings and functions. The famous Varanasi sari has elaborate brocaded ornament, often infused with gleaming zari and woven on very heavy gauge silks. The ornament style associated with it is primarily Persian. Delicate floral and architectural ornaments, figures and animals rendered in detailed multi color threadwork lend the sari its elegance. Sarisafari visited Varanasi to see the weaving production. Kanchipuram is a mid sized city in the northwest of Tamil Nadu. 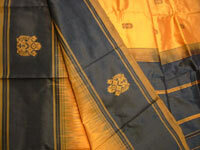 The surrounding area is rich with ancient weaving tradition - most famous is the richly brocaded Kanchi silk sari. Wide borders of colored threads and or zari, and striped style pallus woven in a simple tribal style are hallmarks of this style. Fashion demands have varied the style pallette of the region and the Kanchipuram weavers are now producing modern as well as ancient designs and sometimes an interesting mix of the two. Kanchi silk is generally handspun, giving the cloth a slightly variegated sheen, best described at going in the direction of dupioni silk, but much less textured. The gauge varies a bit, but the classic Kanchi silk is a heavier gauge and fabled to last a lifetime. With a distinctive golden haze and light weight loft, Tussar silk is back in fashion on the Indian market. 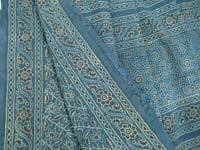 The latest jewel is the Pashmina sari, which is a blend of wool and tussar silk. 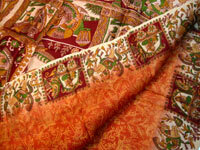 Madhya Pradesh is producing these sarees with combinations of threadwork and bagh printing. 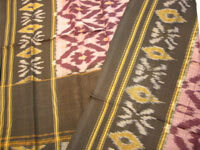 Crisp Tussar handlooms from Varanasi are often featured in the sarishop as well. 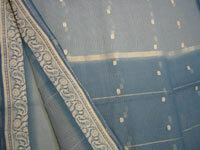 Vafta, produced in Madhya Pradesh is an angelic blend of silk and cotton. The light grounds have a lovely golden haze from the silk warp. The drape is as comfy and lofty as cotton but has the dazzle of silk. These are very finely printed in subdued colors using traditional block printing. Metallic finish and heavy gauge silk with delightful yarn dyed patterning. The shiny and burnished metal finish of the silk sari is it's most obvious appeal and is only possible through using the locally produced silk fiber. 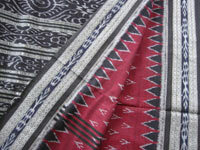 Heavy threadwork borders and pallus add to the overall effect of geometric ikat patterning. 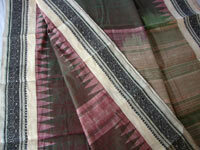 You can read more about ikat in the Orissa pages of the safari. Talk about handmade! It takes an average of 5 weeks just to dye the fibers for these sarees! These pieces are a Sarisafari exclusive, direct from the weavers of Kotpad, a small village in the south of Orissa near Koraput. You can read the article about the natural dyers of Kotpad. Also featured in this section: Habaspuri tribal sarees, Siminoi style bomkai sarees and Gunderi tribal shawls. 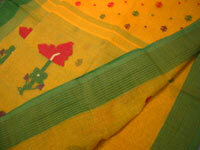 These are sarees are machine loomed Bengali silk, which has a china silk like finish but is more textured. The cloth is fine gauge and lustrous, often printed with delicate Bengali tribal style prints or classic Kashmiri inspired designs. 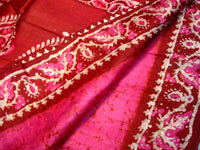 Hand tie dyed light cloth, both cotton and silk with the classical look of Rajasthan and Gujarat. The sari cloth is folded in on itself, and tiny knots are sewn into the folded layers The Rajasthani color pallette favors light and bright colors, which one can understand given the monochrome landscapes of the region! Real batik resist dying is done in textile centers all over India. The ornament has a distinctive craquelure finish that confirms it's authenticity. 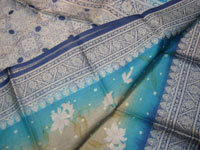 Wax is applied to the sari as a resist, and the patterns emerge through numerous wax application and dyeing steps. You'll find batiks in the Murshidabad silk section as well as the Sungudi print section of the Sarishop. 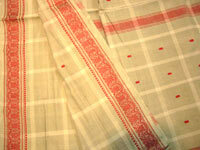 Bengali handlooms are known for their transparent and crisp muslin like finish that is a joy to wear on a hot day. The lightness of the body cloth, combined with wide and silky threadwork borders and elaborate pallus with supplementary threadwork ornament give the sari it's unique evenness of drape. 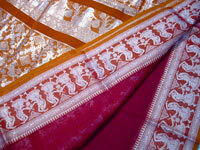 The "tant" or hand loomed sarees of the region boast a tremendous range of styles and colors. 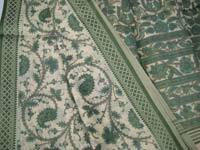 A highly transparent cloth with supplementary threadwork ornament, which is "Jammed" into the weft. Designs are simple and geometric tribal style, unique to Jamdani handlooms. Peacocks are a favorite motif in the style, as are bold vines and flowers. Detailed figures, animals and architectural scenes are depicted on these sarees. The classic Baluchari has scenes from the religious epics of India. 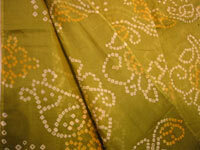 Wide borders feature repeat motifs from the pallu, often densely woven vignettes arranged in sections across the cloth. The classic Baluchari sari of Bengal was woven on the same cloth as the Tant sarees, but now with many regions weaving these style sarees, you can have Baluchari style sarees from anywhere. If I'm aware of a sari's origin, I will always mention it in the listing. 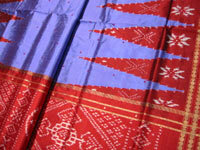 The state of Orissa adopted the ikat weaving tradition, it is said, from the Patola area weavers of Gujarat. So confusingly enough, it's sometimes referred to as Orissa Patola ikat. I've found this to mean two distinctly different things, some use the Patola adjective to denote double ikat weaves, and others just to mean Ikat weave. Ikat patterning is done by first dying the threads according to the pattern layout. As the sari is woven the pattern emerges. It's never quite millimeter in sync giving it the delightful jaggy look that bestows ikat work some of it's charm, as does it's bold geometric ornament, wide temple style borders all rendered in a uniquely Orissan tribal style. The cloth is super fine and densely woven, with a slight flannelly touch. It's density and border weight give it a heavier drape that's a delight to wear. 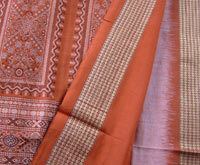 The quality ikats we procure in Orissa are exceptionally well executed examples of the craft. Bomkai sarees feature threadwork ornament borders and pallu, some combine small touches of ikat work. The sarees in this collection were all picked for their traditional tribal look, as well as their understated and elegant color pallette. The turgid heat of the Rajasthan desert inspired this mesh like cloth that is so airy - it's like wearing a fan. Hand loomed Kota Doria sarees in pure cotton are a rare find - polyester is gaining more and more ground. There are many varieties of machine loomed Kota fabric, which is also soft cloth with an airy feel that picks up the slightest breeze. Madhya Pradesh produces a super light sari with a soft translucence unique to the cloth. 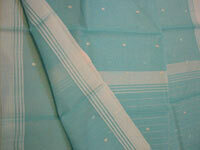 They are generally a very plain sari in muted pastel colors, narrow bordered piece with simple striped anchal. Others have small bhutties through the field. 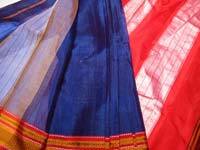 The term Chanderi is often misused by sariwallahs to describe any kind of light and see through cloth. Chanderi style cotton is highly prized for it's airy feel in the hottest days of summer. It's almost impossible now to find Chanderi in pure cotton. Read more about Chanderi sari production and history. Maheshwari sarees are light and airy, a bit heavier than Chanderi, and with lustrous tightly woven zari borders in geometrical designs Traditionally they had narrow borders and simple pallu, but today anything goes. The weaving center is busy, the sarees are in high demand. 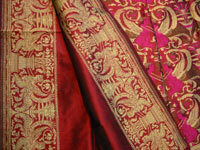 Read about Maheshwari sari production and history. Banhatti produces the low cost daily wear sarees of the state. 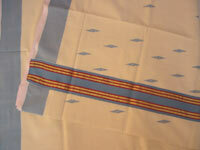 These have simple plain or checked grounds with large golden threadwork borders and pallu stripes. Sarisafari visited some weavers in Ilkal in 2008. I tried to find it after first seeing the sari's distinctive flag like pallu on the streets of Mumbai. It is not seen often outside of this region. These are 6 7 and 8 yard sarees with a shiny mercerized finish on a very light weight cloth. 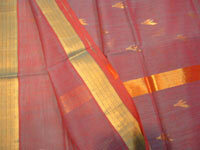 Traditionally the pallus were woven with silk but in modern day the most sarees are made with rayon blends. Venkatgiri sarees from Andhra Pradesh are a crisp and lightweight cloth, woven with a shiny finish yarn in very fine gauge. When worn it is like a soft gossamer cloud about the body. The cloth stands apart not only in its distinct finish, but also in the subtlety and style of its ornament, often with wide bold zari and threadwork borders. Venkatgiri pallus are generally bold and simple to match the borders, but the high end range has elaborate and heavy zari brocade and bhutties. Sarees woven in this area near the coast are some of the softest and most comfortable you'll experience. Their simple and tribal style ornament is seen on village women since centuries and the same classic aesthetic continues in a wider range of colors. They feature fine threadwork borders, usually narrow, with pallus ranging from simple stripes and sparse bhutties to elaborate weft ikats. The fields are plain or check with or without bhutties. These are the perfect dance sarees as they are stable and less transparent than many South Cotton Sarees. Their timeless allure is comfortable for everyday wearing. 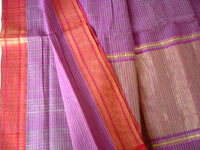 Bandarlanka and Upadda also produce similar type sarees. They are often in the collection as well! Pochampalli ikats can be differentiated from their cousins in Orissa by their feel. 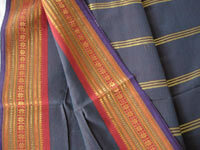 Pochampalli cloth is smoother than the flannelly Orissa cloth and not quite as heavy. Bold ornament often will all over field work lend these sarees their unique vibrancy - great for everyday wear or for adorning a room. This sari collection features ikat ornament made with both warp and weft patterned borders and weft patterned fields. These sarees from Andhra Pradesh have very dense zari borders, usually framing plain or micro checked fields. Thick lines of lustrous zari adorn the pallus in typical tribal style. 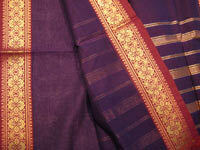 The border zari work is very dense giving the sari a beautiful drape. This cloth is now big in fashion for stitching salwaars and suits, so the sarees have made a bit of a reimmergence into the shops, but as usual the longevity of tribal styles hang on a thin line of contention with fashion! 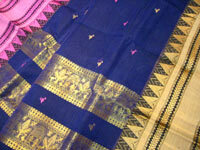 Coimbatore cotton sarees often feature elaborate cotton brocade worked borders and pallus. 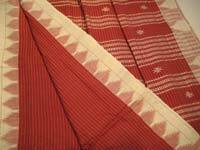 This fine and airy cotton sari on the low range have plain fields and very understated pallu ornament, often just fine stripes. The high end sarees feature thread and zari work framed by intricate colorful threadwork borders. These sarees come in a great range of color combinations, including mouth watering shots. These are some of the most well executed sarees I've seen, and could rival any silk with their elegance. This region produces beautiful varieties of cotton handlooms. The handspun saris have a pebbly finish and a delightfully soft hand. The ornament is usually classically tribal, with wide borders, often in temple style and the multi striped pallu with line ornaments. They share the same ornament as the tribal Kanchi silk sarees. 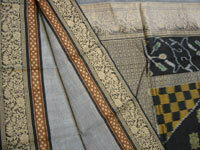 Another type of sari is also woven in the region. It has a crisp, linen like finish and finer tribal ornament. The borders often have zari and colored threadwork ornament, the striped pallus are dotted with bhutties that extend into the field. The traditional two piece sari of Kerala is woven from a super fine muslin type cloth and features very simple border and pallu ornament, one or two colors combined or zari on a natural cotton colored field. The pieces in the sarishop were made in the small village of Balarampuram on the S. Kerala coast. The temperate seaside climate allows the spinning of the super fine thread that lend the cloth it's signature texture and charm. 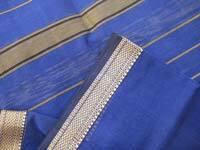 Balarampuram also weaves one piece sarees in the same cloth. Follow the link to read more about Balarampuram in the tour section of the website. The sheer variety of styles of printed cotton sarees is mind boggling. Most commercially printed cotton sarees are screen printed in large cities like Bomb ay and Calcutta, and the mills of Surat in Gujarat. These are the everyday staple sarees of the working class of India. They are worn from North to South, East to West and are the best bargains in the Sarishop. The sarishop stocks all kinds of traditional block prints. Ajrakh and bagru prints from Gujarat and Rajasthan and resist died Bagh prints from Madhya Pradesh and Dabu prints from Rajasthan. Natural vegetal died Kalamkari prints too from Andhra Pradesh. 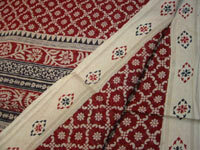 These block prints have a time honored aesthetic and are printed on soft and fine voile cotton. If 6 yards is just not enough then indulge in 9! Sarisafari goes to great lengths to procure a good variety of nine yard sarees in cotton and silk. Varieties produced in 9 yards that are usually available are: sungudi prints, Mangalagiri, Madurai, Kanchipuram, Ichalkaranji and Belgaum are available as well and Kanchi silk 9 yards. A whole world of draping options opens up when you have 9 yards to drape with. You can read more in particular about regional saris by clicking a desired dot on the map, or see examples of regional weaves in the sarishop.